After living in CA for nearly 8 years, I had yet to visit Mammoth. Maybe it’s because I’m not much of skier or downhill MTBer. Everyone raves about it and it isn’t too far (5-6 hours). My excuses for not going were pretty minimal. 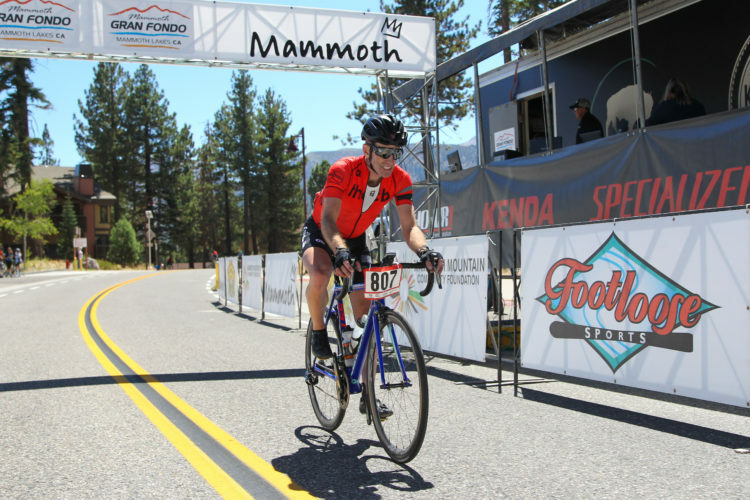 The Mammoth Gran Fondo is held every September, and is often ranked as one of the best in the country. I’ve had several friends do this ride before and loved it. It just happened that this year I was visiting Yosemite the week before, so I would be in the vicinity (and have my bike). Plus, several of my riding buddies from the OC were doing it. The registration fee was also reasonable at ~$100. OK, I guess I’m game. I had been camping in Yosemite at 6000 ft, so I thought I would be ready for Mammoth…sort of. Mammoth Lakes is at 8000 ft. I’ve always wondered what a difference 2000 ft makes at this altitude and you can feel it. Climbing up to the Tioga Pass at 10,000 ft earlier in the week had proven this fact to me. I wasn’t too worried about the climbing though, since the Gran Fondo route was relatively benign compared to some of the rides I do. Packet pick-up on Friday was a breeze at Footloose Sports–one the local bike shops. I had gotten a place to stay on Airbnb, and met friends out for dinner. I was taking a laid back approach to this event, but was very familiar what the results were for riders in the previous years–especially the ones who I knew. My only goal was to finish in under 5:30 hours. I figured this was realistic even if I rode it solo. The start/finish area was nicely setup, but I knew the start would be a sh-t show. There was no real staggering based on rider abilities and the first few miles were all downhill. Despite being “neutralized”, I knew there would be too many sketchy cyclists pretending they were Paolo Savoldelli. I wasn’t even able to line-up correctly and had to nudge my way at the gun. I just kind of held back and coasted the first few miles vs trying to mix it up with a bunch of people who had no idea how handle themselves in a mass start event. Things finally got better once we hit the 395 and we started to go slightly uphill. Here I was able to switch on the afterburners and power my way up to the lead pack. It was already starting to shed riders. Once we turned on to the 120, we had a very manageable grupetto. I just hung in the pack, since I had spent a lot to catch the group. We hit our first real climb at Mile 30, and pack was thinned a bit more. I was also pleasantly surprised to see that they were doing bottle exchanges from the motorbike. The only downside was that I had my nicer Camelbaks. However, the ability not to have to stop at aid stations won out in the end…bye-bye Camelbaks. We had a nice tailwind on a long, straight downhill around the halfway point, and I couldn’t believe my Garmin. It started reading in the low-50s when I glanced down. Turns out We hit 55 MPH…a new record on the bike for me! it didn’t seem like we were going that fast. At this point, we kind of set into a rhythm with the wind and rolling terrain helping. No was one really attacking. The motorbike also kept coming by to keep us topped up. 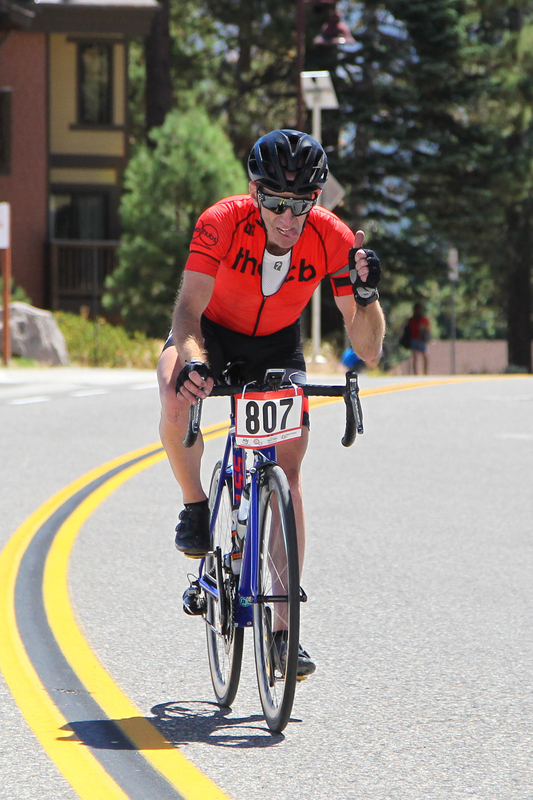 Things all went to hell at Mile 80 when I heard that dreaded air sound…a flat. I knew my chance of finishing with the lead group was gone. Still, I had it fixed in about 3 minutes. I didn’t bother trying to catch up, and instead just settled into a steady groove. That’s when I felt another flat on my rear wheel at around Mile 88. I used my last tube only to have it immediately blow due to a pinch flat…doh! I wasn’t too worried, because sag was out on the course…or, so I thought they were. Nothing for about 5-10 min, then other riders started to come by. I held my arm up asking anyone to throw a tube. Nope. After a few more minutes, a rider doing one of the other distances was nice enough to stop. Unfortunately, his spare tube had been patched too many times and wouldn’t hold air. Sigh. I thanked him and he took off. Eventually, one of the course support motorbikes stopped by, but he didn’t have any tubes. He drove up to the next aid station to get one. By the time I finally got the flat fixed and on my way. 30 minutes had gone by. Damn. The last 20 miles really sucked. They were slightly uphill and there was a headwind. The steady stream of riders that I past kept me motivated. Ironically, I bumped into the daughter of some of the folks who were on my Tour de France group last year (small world). We rode together for awhile and chatted. We were both completely spent at this point. Coming into town, we ended up getting stopped at the only red light on the entire route…WTF! I was just happy to cross the finish line at this point. My moving time was still really good…4:45, but my elapsed time was 5:25. Well, I can’t complain…my goal time was 5:30, so I guess I can say mission accomplished. At least I looked good crossing the finish line. Overall, I really liked this event. It was well run and the course wasn’t too hard. I still like the Tour de Big Bear better, but I can see why this is one of the highest rated gran fondos in the country! Next Post: What the Heck?